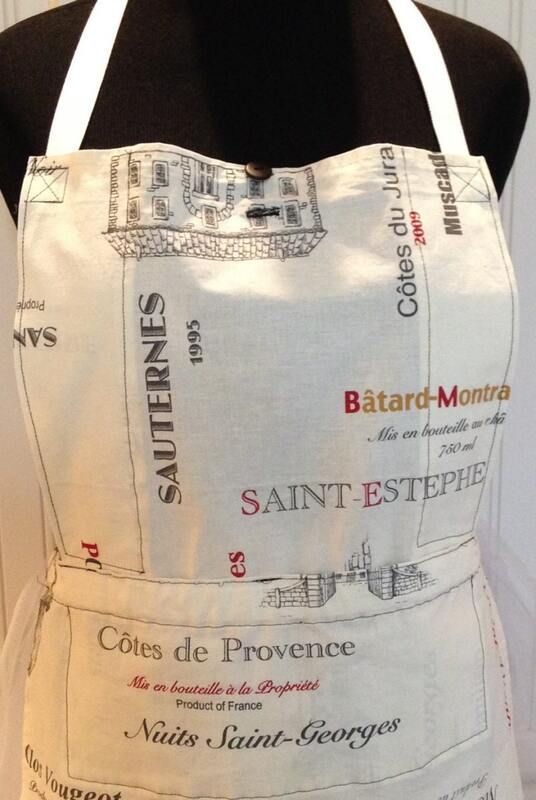 These hard working aprons are made from sturdy 100% cotton towels that were purchased for a bistro in France. 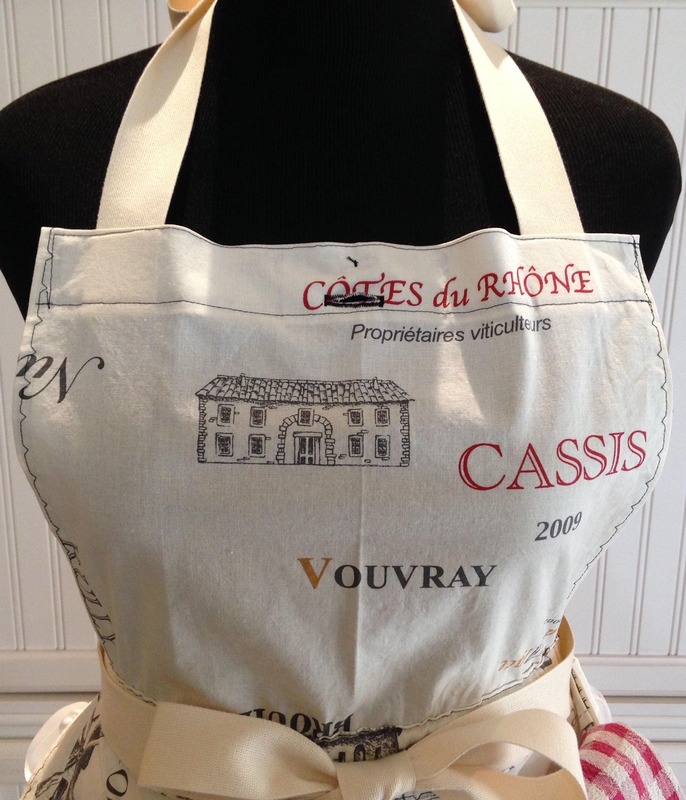 True to their heritage, they are printed with wine, vintners, and vintages that will make you want to break out the vino! The material is easy clean toweling with cream twill ties. The generous waist ties are long enough to tie in front or on the side as pictured. 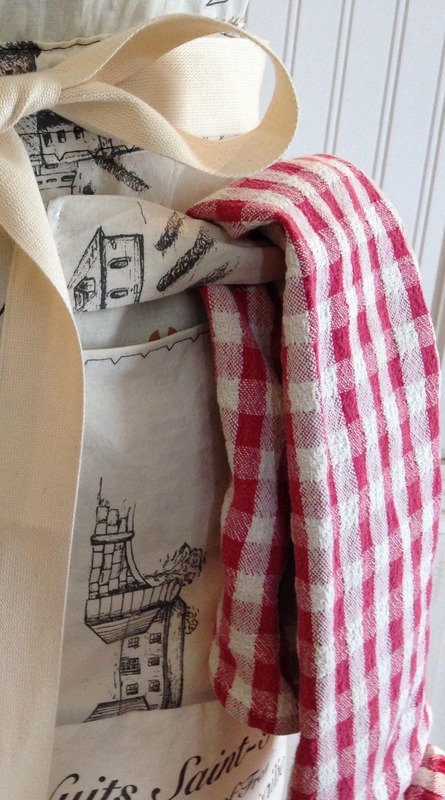 There is a hand depth pocket at the waist that spans the front if the apron so you can keep your cell phone handy. 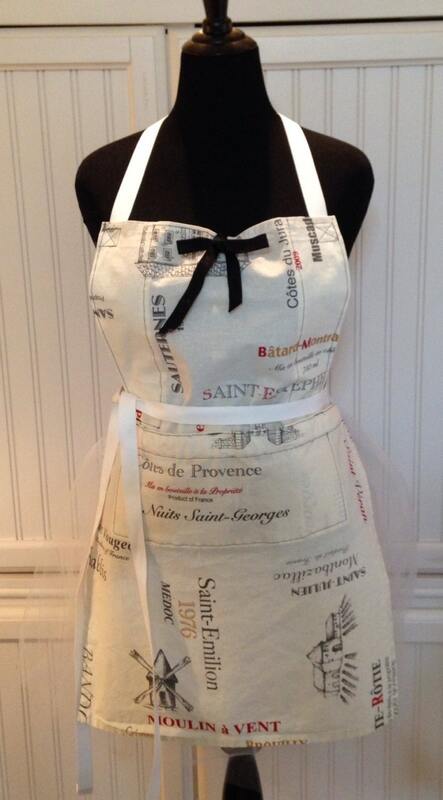 This apron has a uniquely designed bodice. Use the thin black ribbon to tie a bow this will ruche up the bodice and ooo la la! For less cleavage, remove the ribbon, fold the button back or down and slip it through the buttonhole on the bodice, voilà! modesty. 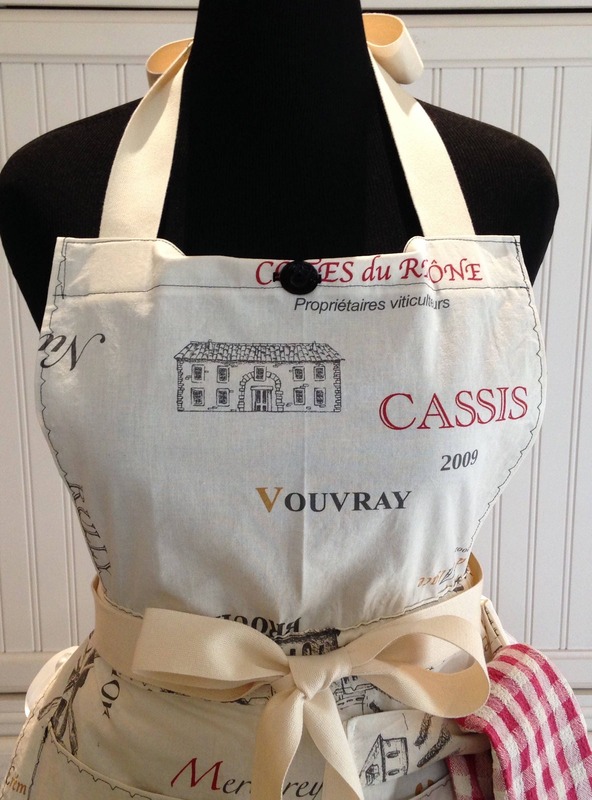 For a hard working no nonsense chef, or if your hubby wants this apron, just leave it unbuttoned and you have the traditional square bodice! 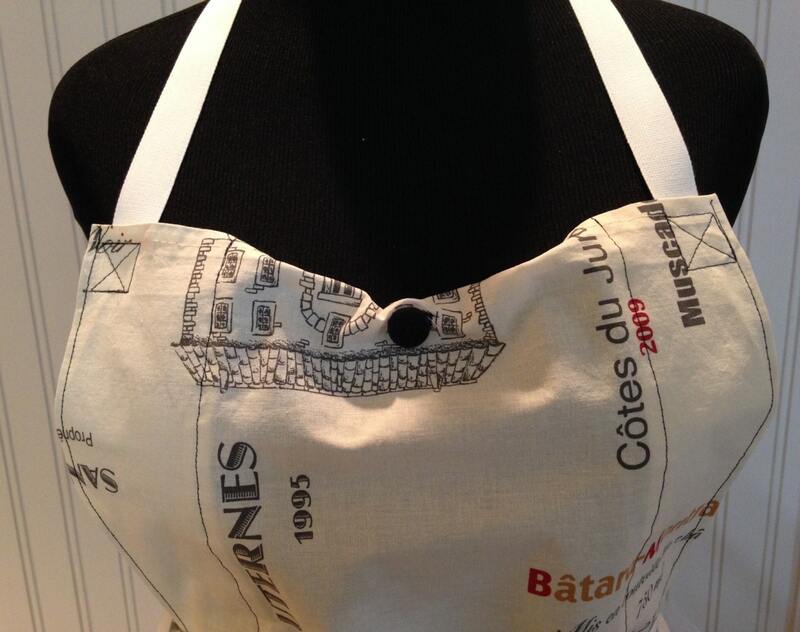 Three looks in one apron! These are adjustable enough for anyone to wear with ease, so buy several, one for you and another for your kitchen helper too. 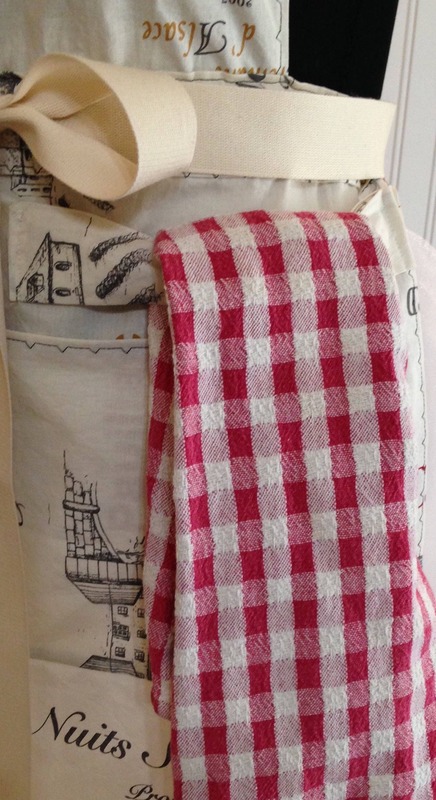 Optional towel strap can be added as pictured for a slight fee. Please select this option if you would like the strap added as pictured. Machine washable, cold water and low heat dry recommended to keep colors bright. Note: if you would prefer black twill ties please let me know in comments and I can substitute them for no extra charge. Really looking forward to trying out this well made apron. It is cute and practical! Added the loop for the towel, as I am constantly washing my hands when I made dough. 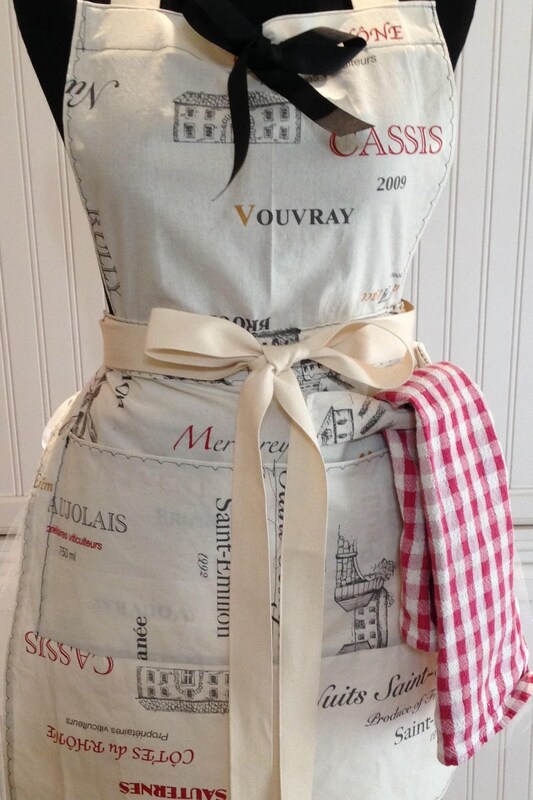 Love the apron! Thank you for adding the towel strap. Quick shipping. Thank you! My new favorite apron!! Super fast shipping and very responsive.